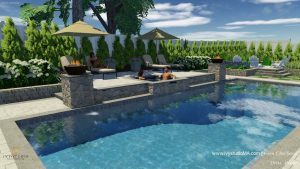 IVY Studio, LLC an outdoor expansion consulting firm designing and installing pools and spas and based in Massachusetts has redefined traditional pool and spa building methodology. Understanding a client’s wishes for a pool and spa project requires a methodical and detailed staged approach before you apply pen to paper and begin with the initial design ideation. A good place to start is listening. Listening to what your client wants you to create and balancing this against the challenges of physical property and budget as well as your initial professional instincts is usually the springboard to developing a sound design that evolves with time and input into a working plan that can be implemented. The art part is converting a two dimensional plan into a living and breathing real time, real life document that enhances the client’s visual perception and acuity. We create lifestyle three dimensional model perspectives that allow the client to experience the design in different settings that closely mimic reality and this tool, is a great enhancer for the client and usually helps close the deal! To learn more about our process, please contact us 781-591-0300 or vern@ivystudioMA.com.